Acclean’s nonsplattering, gluten-free formula contains 1.23% fluoride and offers superior polishing finish with a quick, easy rinse. Unit-dose cups are packaged in quantities of 200 per box in a choice of mint, bubble gum, cherry, raspberry, cinnamon, tangerine, vanilla, chocolate, and strawberry flavors in fine, medium, coarse, and extra-coarse grits. 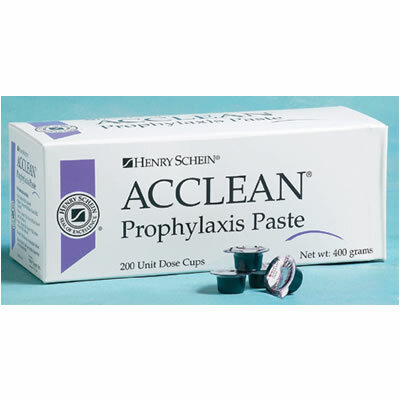 Good paste; splatter-free; just wished the cups fit into the blue prophy holders!